Redemptorist Father William Geiger died unexpectedly at St. Clement Mission House in Ephrata, PA, on Sunday, June 17. A priest who had been ministering to prisoners for the past 30 years, he was found at his desk, having been writing to inmates of the Lancaster County Jail. Father Geiger was 79 years old. A native of Rochester, NY, Father Geiger was born Oct. 14, 1927, the son of the late George and Gertrude Bradler Geiger. He grew up in St. Andrew Parish and entered the Redemptorist minor seminary in North East, PA, after finishing grammar school. He made his first profession of vows in 1949 and his final profession in 1952. After completing his studies at Mount St. Alphonsus in Esopus, NY, he was ordained to the priesthood on June 20, 1954. "He was great for putting on plays at North East and for putting on the student movies on Saturday nights," recalled his confrere, Father Carl Hoegerl. "Father Boelcke was the movie man and he chose Bill to help him because he was reliable and conscientious." Father Hoegerl said that Father Geiger was such a talented preacher – "he had a nice strong voice, was well prepared and interesting" – that his first assignment was to a mission preaching band based at St. Boniface Church in Philadelphia. After serving there from 1956 to 1962, he was sent for two years to Annapolis, MD, to teach preaching to newly ordained Redemptorists. Baltimore Provincial Superior, Father Patrick Woods, said that Father Geiger always loved to preach about Our Lady of Perpetual Help and became known as one of the finest promoters of her devotion in the Province. Other confreres noted that Father Geiger’s own love for Our Lady was a constant feature of his spiritual life. 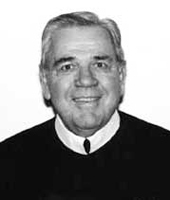 During what his friend Father Arthur Gildea described as "the toughest time in his life," Father Geiger was assigned next to serve as Prefect of Students at Esopus from 1964 to 1968. It was during this period that students from the St. Louis Province (now Denver Province) merged with those from the Baltimore Province. It was a time of great change on campuses across the country, with the turmoil over the Vietnam War, the rise of the Black Power Movement, and, for Catholics, the challenges brought about by Vatican Council II. From 1968 to 1972, Father Geiger served as Minister for the Redemptorist Community at North East. Father Hoegerl recalled what a big job this was, as it involved overseeing the farm and the vineyard, as well as tending to other needs of the confreres. "He was a kind man, a gentle man, always willing to help and do things with the community," said Father Lawrence Lover. "He also was very practical with all kinds of mechanics. He also was a great community man, with a great smile and a good sense of humor." Described as well as "a jovial man," Father Geiger "could fix your bad mood or fix your broken light bulb," according to Father Michael Hopkins. Father Geiger’s first assignment as pastor was to St. Gerard Church in Lima, OH, where he served for the next six years. "Almost everywhere he went, especially at Lima and, later, at Ephrata, he did prison ministry," Father Hoegerl said. In Lima, he went every Saturday morning to the nearby state penitentiary. "These were toughened, hardened people," said Father Arthur Gildea. "He had great compassion for them and he treated them like he would any other parishioner." According to Father Gerard Szymkowiak, who got to know Father Geiger well in the Lancaster County area, he not only visited prisoners, but followed up with them, helping with housing and employment and writing to them monthly. Father Pierce Kenny, who went to Lima when Father Geiger’s term was finished, found him a hard act to follow. "He was a hard worker at physical labor and when we got there, the parishioners expected us to be there cutting the lawn just as he had done!" Father Lover recalled that his confrere has gained the respect and admiration of the men At St. Gerard because when it came time to paint the school, Father Geiger was with them, a paint cap on his head and a brush in hand. His administrative talents and his championship of Catholic education were such that at the end of his second three-year term in Lima, Msgr. E. C. Herr, principal of Lima Central Catholic High School (LCC), wrote to Father Joseph Hurley, then Baltimore Provincial Superior, to ask that Father Geiger be able to remain. He wrote, in part: "I know the serious situation that the parish and school were in when Father Geiger came – also our relationship at LCC with St. Gerard’s. It was through the dint of his personality and hard work and leadership that St. Gerard’s parish was turned around. The school is now growing and our relationship is a strong one at LCC. Father Geiger’s introduction of the kindergarten and his strong interest in the children at St. Gerard’s School, together with his constant appearance in the school rooms, has made St. Gerard’s again a strong Catholic school. Frankly, even regarding marriages, there is no one left in the City of Lima amongst the four parishes to whom the young people will go except Father Geiger." Father Geiger brought those same talents to St. Anthony Church in Lancaster, PA, in 1978. Under Father Geiger’s leadership, the exterior of the church was completely renovated. To help parishioners visualize the progress of the work, Father Geiger build a model of the building in Lego® blocks, with the display growing to keep pace. (Other of his creative works have become local family heirlooms, such as model railroads and doll houses he built to be raffled at the annual parish bazaar.) His talent for preaching was brought forward here, too. He preached the weekly parish novena to Our Lady of Perpetual Help and always made himself available to talk about her in other parishes. In 1984, he was assigned to St. Michael Church in Baltimore, MD. Although there only one year, he envisioned a future for St. Michael’s, not as a parish but as a center for evangelization and mission preaching, with confreres visiting the homes of all the inactive Catholics in Southeast Baltimore. The following year, he was assigned again to mission preaching, this time based at St. Patrick Church, Enfield, CT. In 1987 Father Geiger was back in Lancaster County, this time as pastor of Our Mother of Perpetual Help Church in Ephrata and rector at St. Clement Mission House. Father Gildea, who succeeded Father Geiger there, learned that his confrere had been out daily taking care of the grounds, especially the pool. The pool, which had to be cleaned and chlorinated regularly, was for the use of all the Redemptorists in the area and a swim was usually a prelude to the guests having dinner at St. Clement’s. Father Szymkowiak, who was in residence there while pastoring the St. James Church in Lititz, said, "My whole life I’ve been gardening. I would plant, then he would water the plants." The two worked together on another of Father Geiger’s hobbies – an elaborate model train setup. "He was the engineer and I did all the landscaping for a number of years together," Father Szymkowiak said. Father Geiger’s hobby inspired Father Kenny to find his own – ceramics. He marvelled at how Father Geiger found time to do everything he accomplished and was impressed with the way he lived such a balanced life, he said. For one year, 1993, Father Geiger served at Notre Dame Retreat House in Canandaigua, NY. He then returned to St. Anthony’s in Lancaster until being assigned again to Ephrata in 1999. Being officially retired then did not make much of a difference in his schedule. Father Patrick McGarrity, pastor of Our Mother of Perpetual Help Church, said that his confrere continued to help out in the parish. He also kept up with his prison ministry, even when he began to suffer from narcolepsy and had to depend on Father Szymkowiak as his driver. Father McGarrity said that Father Geiger’s "interest in ministry, his rich Marian spirituality, and his drive to keep helping people were the real highlights of his priesthood." Father Kenny summed up his confrere’s life in this way: ‘There was not a finer Redemptorist than Father Geiger." In addition to his brother, Father James Geiger, of St. James Church, Concord, NC, survivors include two sisters, Marie Alekson, of Rochester, NY, and Marge Volpe, of Chapel Hill, NC. Father Geiger is predeceased by a brother, Tom, who lived in Rochester, NY. The Wake Service is scheduled for 7 p.m. Wednesday, June 20, at Our Mother of Perpetual Help Church, Ephrata. The Funeral Mass will be offered there the following morning at 11 o’clock, with his brother, Redemptorist Father James Geiger, as the main celebrant. Burial will be at St. Clement’s.